Might's creatures are, on average, more inclined to dealing physical damage rather than casting spells. They are also cheaper to recruit to compensate for their lack of magic. They are a very well balanced town besides this problem, having up to 2 shooters, 2 flyers, and a walker. They have creatures that are among the most powerful in every level, except the last. Berserkers, although uncontrollable on the combat map, have very high statistics for a level 1 creature, with 18 hit points and the ability of two attacks. The latter makes berserkers excellent for attack castle walls, additionally, due to their high growth rate and damage; they are effective (and fairly fast) creatures that are able to defeat level 2 creatures such as elves in a hand to hand battle. Due to their cheapness, they can be used early in the game (with the help of the Barbarian hero and Centaurs) to clear the surrounding area of neutral creature stacks. Statistically the best level 1 creature, but the fact that they are short ranged makes them ineffective in their job as a ranged attacker. They also have a low growth rate, but they make good scouts for the Stronghold due to their 25 movement on the adventure map. They make a good melee creature whenever they are attacked (dealing 3-5 damage! ), which makes them worthwhile in combat. Harpies are average fliers that have very good movement on the combat map, but this isn't translated into adventure map movement. They have relatively low hit points and don't deal good damage, but their strike and return special enables them to stay out of the line of fire while still dealing damage, think of it as a harpy boomerang. :) This ability isn't spectacular in sieges where fliers are forced into the moat to attack, but they can effectively waste a creature's retaliation. Nomads are fast and sturdy travelling horsemen whose first strike ability enables them to make full use of the 6-9 damage rating. Their 45 Hit Points are characteristically high of the Stronghold army creatures. They can move a fair distance on the battlefield, making them almost as versatile as a flyer, or a more effective White Tiger. First strike is accentuated against ranged attackers. The Cyclops enjoys the benefit of having an area attack, damaging multiple creatures at once. They are magnets for opposing sides, as making Cyclopes revert to their melee state is the only way they become ineffective (apart from forgetfulness). Their low growth rate can be easily offset through the purchasing of breeding pens and the use of a Lord's nobility. Their area attack cannot be retaliated against, and always forces the opposing player to spread their forces out in fear of this attack. Ogre Mages are very solid creatures, even though they have 10 less hit points than the Cyclops. They are the Stronghold's only spellcaster (barring Mermaids), though it is not effective on a grand scale. They also have less adventure map and combat movement, but are very cheap at 350 gold, even though the Cyclops itself is a cheap option at 750. Behemoths are more powerful when in a single combat, but the Thunderbird's growth exceeds them by 1. However, the Behemoths are relatively cheap to build and buy, as well as having superior attack and defense ratings. They are not as fast as their thundery bird buddies, nor do they possess the mobility that only a flyer can give - which is important if the Harpies were not chosen. Thunderbirds are quite powerful creatures in that they deal 30 lightning damage after every attack for 1 Thunderbird, which is increasingly more effective as more of them are recruited. They have a good growth rate of 3, and are very inexpensive - only 1,800 gold and 2 mercury. It is fast and mobile on both maps. They are a more logical choice for the town on most occasions, but their requirements make it difficult to discern which one to recruit. The Stronghold castle is unique in that it only has one specific hero class - the Barbarian, while it can recruit magic heroes from all other alignments. This provides them with superior physical attacks and methods of finance and exploring - the Lord and the Thief classes are both available. The complete list of heroes a Stronghold town can hire are Barbarian (unique), Death Knight (Death), Thief (Chaos), Archer (Nature), Knight (Life) and Lord (Order). Barbarians are the most pugilistically inclined heroes, meaning they will always be offered some form of combat, scouting, or sometimes tactics. The most vital skill to a Barbarian is the Combat skill; it is here where the Barbarian develops the three main facets to his or her combat plan: melee, archery, and magic resistance. The Grandmaster melee skill is effectively doubling the hero's potency in melee attacks, and is invaluable in collaboration with the first strike ability attained at master level. 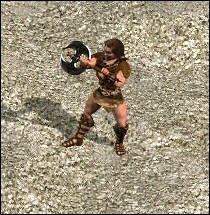 Archery is used as a secondary attack for Barbarians, and it improves in much the same way. Thirdly, magic resistance is a skill imperative against all other factions, that do have the benefit of magic. Even basic magic resistance is an important weapon against a powerful sorcerer or mage. When the Barbarian hero has reached the stage of Expert Combat, he/she can start to branch off into other skills, namely tactics, and, to some extent, scouting (though this role is fulfilled by both the Thief and the Lord). Tactics is another important skill for the Barbarian class. It provides the army with added movement, as well as having valuable branches such as offense and defense, which are highly beneficial for such a physically intense army such as the Stronghold. It may be beneficial to help the Barbarian along in the adventure map with a fast thief until the Barbarian has a chance to develop the tactics skill sufficiently enough to travel on his or her lonesome. Premier Resources: Wood, Ore, Crystal. Despite having very limited access to magic, the Stronghold are not so much compensated by cheaper buildings, but by more unique buildings, even though they have the least of any town due to the absence of mage guilds. The Stronghold town is a quite slow town to develop, especially if Cyclopes are chosen - which is very much the recommended option. Pre-requisite buildings are very expensive in relation to other towns, and ones like the Citadel and Castle are not buildings that need to be erected urgently - especially for a town with an aggressive nature. With the earliest optimum combination, the Cyclops Cave can be purchased on the fourth day, as slow as Preserve, and slower than the rest. Despite the fact that the Ogre Fort can be built a day earlier than the Cyclops Cave, this is ill-advised because the Cyclopes are the best level 3 ranger, and are much more effective than the Ogre Mage that can only cast Bloodlust. The requirements of the Behemoth Crag and Cliff Nest are very expensive, the former needing 2 structures totalling 6,000 gold, and the Cliff Nest requiring the Castle, costing 7,500 gold - overpriced for its function. Crystal reserves would have been significantly depleted by the construction of the Cyclops Cave, but only 1 Mercury would have been used for the Harpy Peak. When constructing the Cliff Nest, it is advisable that the Harpy Peak is built first - as it needs the Citadel - the step below castle, making a natural progression. If the Nomad Tents are chosen instead, the player will have to use 15,000 gold for the requirements of the Cliff Nest, as well as an additional 14,000 for the nest itself. Although, if the Harpy Nest is built, it still allows freedom, in that the player can still choose to buy the Behemoth Crag. But, if the Nomad Tents are chosen, it is not economically or developmentally sound to build the Cliff Nest, therefore the Behemoth Crag essentially must be built. Unsurprisingly, Might's structures all deal with the hero's physical development, or increasing creature growth in the town. The Wrestling Pits and Arena of Honour are opposites of each other, adding 3 to attack and ranged attack, and 3 to defense and ranged defense respectively. The magic dampener simply aids the hero in its quest for magical immunity, and sometimes making learning Grandmaster magic resistance unnecessary. A more beneficial effect would have been to add 10% magic resistance to all creatures, (for a higher cost) as creatures are generally very vulnerable. Undoubtedly, the structure that is intended to balance Might's lack of magic, the Breeding Pens, are both invaluable and expensive at the same time; costing more gold than a level 4 structure. Might is a very gold-intensive town, at least needing 49,500 gold to build level 2-4 structures and pre-requisites and the breeding pens. In addition to this gold, the normal resources - wood and ore, are required in exorbitant numbers, especially when building pre-requisite buildings. The Army movement of the might town is quite varied, with a good selection of faster creatures, but an army that is always liable to get bogged down by its most effective combat creature for its level (and probably the town) - the Cyclops. The adventure map movement of the cyclops, as well as its speed, is its worst attribute (though it is still better than Ogre Magi). A level 3 creature is an essential addition to any town, but the army can still explore early on in the game with the use of the Thief hero. Unfortunately, there are no buildings in the Stronghold town that can improve the speed of the army, and it therefore relies on the development of scouting for one main Barbarian or a Thief hero. Once again, the 'piggy back' strategy can be used to speed up army movement with the Thief, but a more reliable and fixed strategy is to provide one Barbarian with the bulk of the Scouting/Tactics skills, while the other will have Combat/Tactics (focusing on tactics secondary skills) to become the combat might hero, while the other acts as the adventure map hero. On the other hand, both adventure map movement statistics of level 2 creatures is superb, 28 for the Harpy and 27 for the Nomad, but, unfortunately, both cannot be selected. The main disparity occurs at the fourth level, where the Behemoth is the equal slowest on the adventure map with 21, while the Thunerbird has 29. This makes a difference at level 2, where if Nomads are chosen, so too must Behemoths. Even though the Stronghold has heroes like the Lord and the Thief to help in the early stages of exploration, their astronomical prices for building pre-requisites stimulates as much movement as possible to be able to afford these structures. Secondly, Stronghold's trump card, the Breeding Pens, needs 15,000 gold, and increases the growth of all creatures by 50%, thus needing 50% more resources to pay for them, which, for the most part, is gold. Therefore, adventure map conquest, of gold mines and normal resource mines especially, is paramount for the Stronghold army. and to Lich (Guardian's Grove Admin, Heroes Community Moderator) for the images.